Want to look younger, more vibrant and WOW? If you are addicted to black because you think it makes you look slim and chic, think again! While it may have looked fab when you were younger, at 40, 50 and beyond black can drag you down and make you look tired, old and frumpy. Hi, I’m style expert Deborah Boland and I specialize in helping women over 40 tweak their chic and look Age-Amazing™. I’ve witnessed first-hand the difference color makes in my clients lives and I’m here to tell you that color is the answer to looking Fabulous After 40. I hear you when you say that black is practical and easy, and you’re concerned about drawing too much attention to yourself “at your age” by wearing color. To those of you who worry color will make you too visible, I say, visible schmizable. As we age and our skin and hair slowly but steadily fades and we need a shot of color to give us some zip. Color is energy, and energy is youthful. And isn’t that what we all want to look full of life! If not black, then what? What colors am I supposed to wear if you don’t wear black? How do you know which are my WOW colors? Won’t I look fat if I don’t wear black? How can I introduce color in your wardrobe if I’m a woman you say has ABD (Abundant Black Disorder)? What other colors spell old lady and do I need to avoid? What are this season’s most popular colors and will they suit me, especially now I’m over 40? What the heck is this color blocking thing that everyone is suddenly talking about? The signs and symptoms of ABD ( Abundant Black Disorder), if you have it and how it ages you. The perfect substitute for black that any woman can wear and look younger and fabulous. 7 simple ways to ease into wearing color that won’t make you look like Carmen Miranda. Our favorite color combining trick that makes you look ten pounds lighter instantly. The powerful psychological messages colors send and how to use color to communicate what you want. The colors you need to wear to look Age-mazing™ at 40, 50, 60 and beyond. How to determine if you look better in warm colors vs. cool colors, and why this makes a difference. The 4 key Seasonal Color Palettes – the types of women who look best in each palette and where you might fit in. The colors you need to beware of (other than black) that can really make you look like an old lady. This season’s newest shades and combinations of colors that will make you look modern and fresh, not old and dated. What color blocking is, what it can do for you and how to get it right. For over 25 years I’ve been helping women just like you Tweak Their Chic and Look Age-Amazing™. I’m an expert in all aspects of image and have appeared hundreds of times on radio and TV across North America preaching this message: color is the single most important tool you have to transform your look and take you from frumpy to fabulous! I’m confident that my suggestions, advice and photo examples will open your eyes and show you the importance of color and how to use it to make you look Fabulous at 40, 50 and beyond. 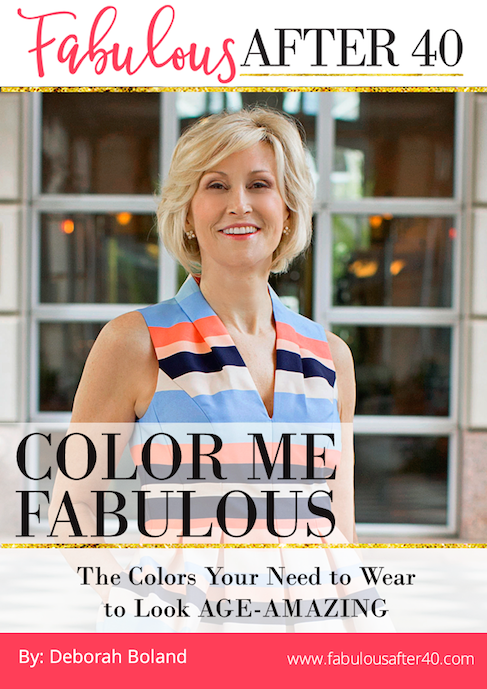 My 59-page eBook (sent to you via email) will get you focused, ready and excited about finding the colors that make you look Fabulous After 40!